What Features Do You Need In A Reporting Tool? Download Now: The Ultimate Reporting Features Checklist. 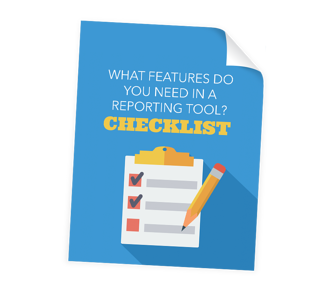 Use this checklist to determine what type of reporting software your organization needs. You have a lot of options—from Excel to fancy visualization tools, dashboarding solutions, scorecard and strategy tools, and more. How do you know which is the best fit for you? This checklist will help you determine what you need. 10 categories of tools you may (or may not) need. 42 individual features and descriptions to choose from. A criteria for determining the right software for your organization. Ready to determine what you need? Download this checklist.